Instrumental surf music has achieved a place in modern culture that seems to be at odds with its origins. The roaring breakers, the blue sky and the bright Californian sun suggest a music that should be joyous; however, within the lexicon of this genre there is an ever present dark undertow. It is this contradictory presence — this sense of danger and even evil, that has, since it’s emergence into the mainstream around 1961, given this music its enduring appeal. Bands like The Fireballs, The Spotnicks, The Ramrods and The Surfaris pioneered this unhinged, amped (oh yes, I am using original ’60s surf slang here) celebration of the wipeout and the quasimoto. Their West Coast and Hawaiian sound, washing up as far away as the shores of the UK in the form of the Shadows, was popular throughout the world in 1960s and 1970s. The modern reinvigoration of surf rock is accredited by many to the use by Quentin Tarantino of “Bullwinkle Pt II” by the Centurions and “Surf Rider” by The Lively Ones in Pulp Fiction (1994). However, this peculiar and hyperactive music, that seems to go so well with murderous and terrifying imagery, influenced a good many bands much earlier, including the B-52s and the Cramps in 1980s. One thing is, however, certain: since Pulp Fiction this music has been overused in a great many media campaigns. Over the last twenty years, it has surfaced in adverts for everything from toothpaste to banks and, because of this, there was a distinct danger that this evocative music might just become a part of our culture’s aural wallpaper and be stripped of any potency. 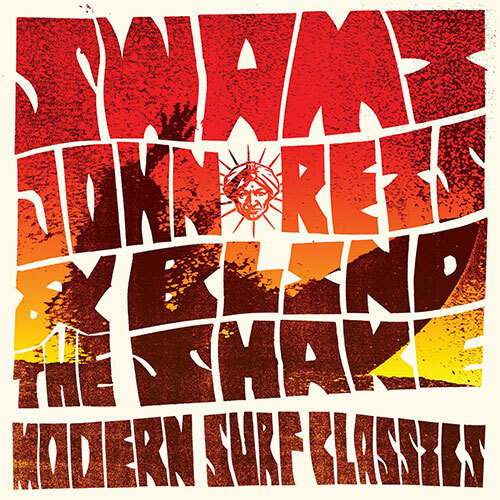 Which brings us to the new album, Modern Surf Classics, by Swami & The Blind Shake. Both authentic and imaginative in its approach this album captures the spirit of the original music, whilst successfully recasting it for the 21st century. The combination of the propulsive and bombastic energy of Minneapolis’ own psych punk combo, The Blind Shake, along with John Reis’ instrumental brilliance, has produced an album that carries the listener forward on a groundswell of pure and brilliant energy. The music of The Blind Shake, a tight-knit combo who are the brothers Jim and Mike Blaha on guitars, alongside drummer Dave Roper, is sharp and robust. It moves with its own firm but edgy articulation and ripples with nervous and spasmodic energies. Bass guitar-less, The Blind Shake prefer to use a baritone guitar for their deeper tones, and this gives the sound its distinctness. Incidentally, it is worth mentioning that surf music was the first genre of music to universally adopt the electric bass guitar, in preference to the upright or string bass. This was because the sustained and trebly sounds favored by surf rock musicians are not easily achievable on the hollow wooden acoustic bass previously used by bands. From the first track, “Sea Saw”, which opens with a Surfari-esque vocal call before plunging into screaming staccato, reverbed guitar and jerky drums, you are up-ended and pulled under, overwhelmed by the wall of agitated sound. Submission is not optional. The saxophone, an instrument long associated with this genre, plays its part throughout the album, offering rasps and honks of brazen encouragement whenever they are needed. “Beach Leech”, a phenomenal and breathless headlong charge of a track, is a good example of its clever use, as the brass baritone serpent bullies and harries the music from start to finish. There are moments of apparently more wistful contemplation, as in the humorously titled “Brown Room”. Sweet and sorrowful in its melodies, it conjures both emotional and visual vistas in the listener. In the choice of the track name, there may be a piece of contemporary environmentalist subtext/humor at work. Within 1960s surf slang, the term “Green Room” referred to the space inside the tube of a wave. Given the current state of our polluted seas, the possibility of a pun cannot be ignored. A genuine Renaissance in American music from the 1960s is occurring due to its creative possibilities, and the surf instrumental is rightly part of that. An important component in the genesis of modern music, it evolved alongside rock n’ roll and jazz, making use of technological advances such as spring reverb and vibrato units fitted to the new amplifiers, to define the sound. Recast and renewed on this album, surf music has, complete with those signature effects, been reinvested with its old power. Sidestepping the traps that come with revisiting anything so well used takes great skill. There has to be more involved in the process than simply producing a copy; otherwise you risk disappearing into the froth. An understanding of what drove the initial act of creation of surf music — the prevailing moods and aspirations, the cultural signifiers and what gave rise to them — is part of it. There must also be a feeling for the excitement and thrill the music can generate. Alongside this, it is essential to understand how that era and its artistic output relates to now. Swami & The Blind Shake appear to have not only grasped this, but have succeeded in combining them to produce the alchemical change necessary to deliver a superb album. The wry and knowing approach, that comes with all 21st century cultural expression, is certainly here. In fact the use of the word Modern in the title of the album, helps reinforce the double-take; that word is surely so outmoded as to be devoid of its original meaning and comes with a whole heap of interpretive baggage. However, as with the title of the track “Brown Room”, and much else on this album, the irony and implication is there for the purposes of fun and as a means of reinforcing rather than undermining the music. This is beach and surfing fun 2015 style. The sand is dirty and the oceans are full of crap, but maybe that is how it has always been.